Wow, I’ve really fallen behind on updating the blog recently, but I have a new batch of invitations to post about! First up is definitely out of order, but one that slipped past me and I never had the opportunity to post about. Lauren and Brian came to BB10 Creative looking for wedding invitations that were unique to their special day. They didn’t have any very specific ideas in mind outside of knowing they wanted something a bit formal and traditional but not excessively floral, as well as having packaging that was clean cut and organized. 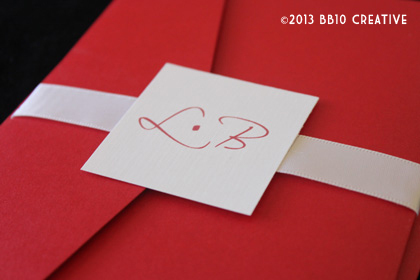 BB10 Creative came up with the following design that incorporated the look and feel Lauren and Brian were going for, as well as their wedding colors of a vibrant red and white. 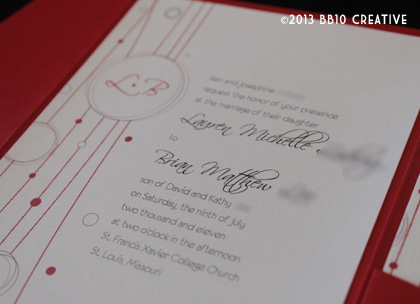 The design of the circles and thin lines is a bit modern but still feels very elegant and formal with the addition of the monogram and the script font used to accent the couples’ names. 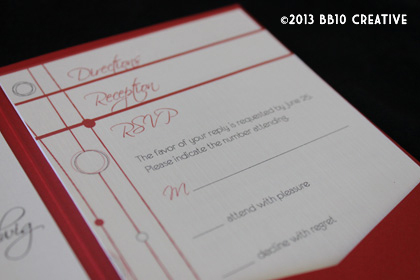 The invitation was printed on clean white linen cardstock and then mounted on a very elegant metallic red horizontal pocket enclosure. We kept the enclosure closed using a bright white satin ribbon with a monogram seal, and then placed the whole thing in a matching red metallic mailing envelope. Along with the invitation, we also printed a simple yet elegant wedding program to coordinate, as well as thank you cards to match. The whole package turned out beautifully. I love pairing satin ribbon with metallic cardstock and juxtaposing it with the clean matte finish of the linen paper. Not to mention metallic cardstock and envelopes really stand out in the mail! 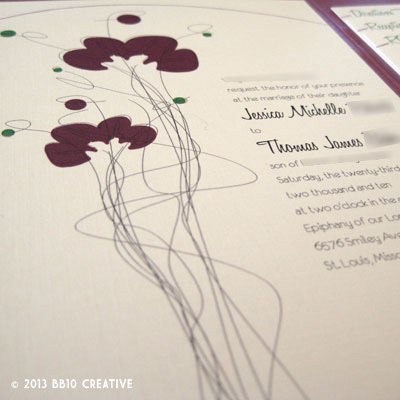 New work to come soon including an elegant, French inspired eggplant invitation set, a “perfect pair” theme and more! The last wedding of 2010 is another special one for me – two of my good friends Jessie and Tom are tying the knot on October 23rd and asked me to create their invitations and programs. Jessie and Tom are both architects and already have a great eye for art and design. And to make things even easier on me, Jessie runs her own color consulting business – Verve! Color. Design. Life. – so she had a really fun color scheme already planned out for the wedding. The colors they decided on were a sangria reddish/purple accented with charcoal gray and bright green. Finding an enclosure to match just the right shade of sangria turned out to be a bit of a challenge, but we came pretty close with a “black raspberry” metallic. I made sure to print the true sangria color on the invitation cards so it helped to tie the pieces together. 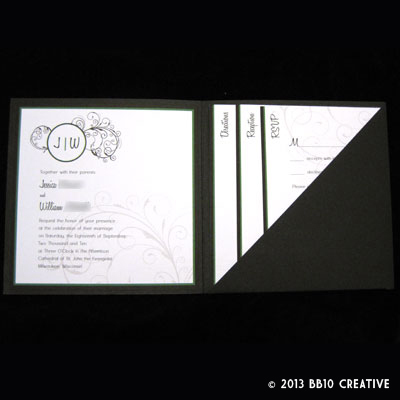 Jessie and Tom decided on using a horizontal pocket enclosure and a clean white linen cardstock. 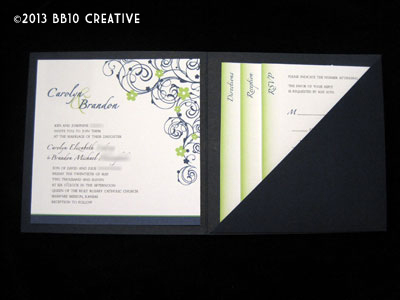 We used a bit of bright green in the design and added the charcoal accent with a very pretty metallic envelope. The enclosures were sealed with a sticker on which we printed the name of the invitees – a great personal touch! 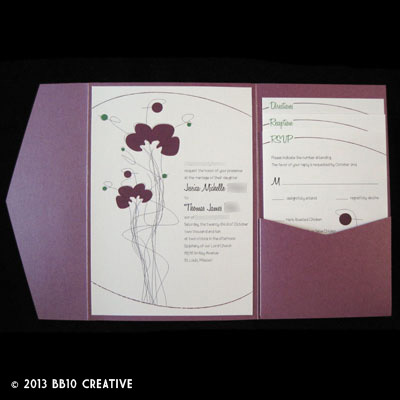 Since we were unable to print on the dark envelopes, we sealed them on the back with a circle sticker that contained the return address and on the front created a fun mailing label using the floral element from the invitation. 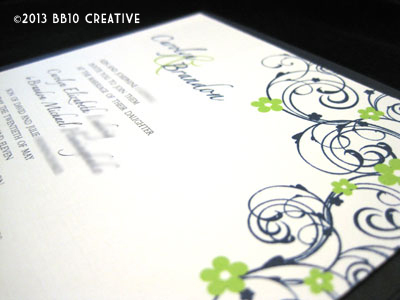 The floral element itself will help to tie the invitations even more into the theme of the wedding. Jessie and Tom are using high table floral centerpieces accented with sticks. 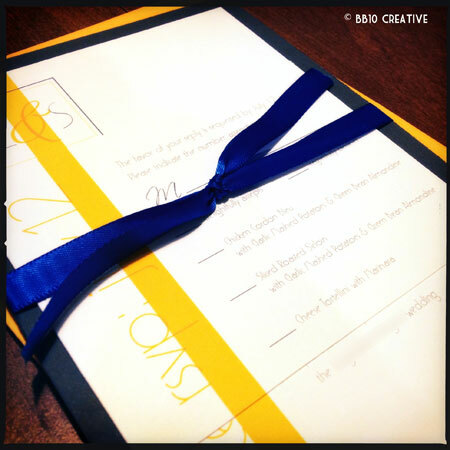 At BB10 Creative we are all about helping to tie everything together for your wedding! Overall these invitations are really fun, yet formal and I feel they are the perfect design for a fun couple like Jessie and Tom. I can’t wait to be a part of their big day coming up soon! Program designs are coming up soon so check back for pictures of the final product! Wedding number one of six for the fall season will be taking place on September 18th between Jessie and Bill. Jessie is a friend of mine from college and I was very excited to be able to be a small part of her big day. Jessie came to me with a very open mind about her invitations. 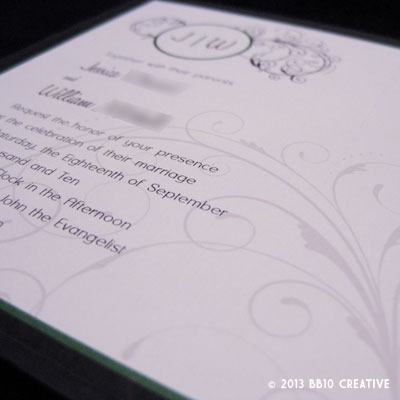 After our initial consultation, we determined that she was looking for something formal, but not too stuffy, and wanted to incorporate her wedding colors of black and silver, with a hint of green. After we narrowed it down to a few designs, Jessie and Bill picked the final – a very elegant and fun scroll design with their monogram in the center. 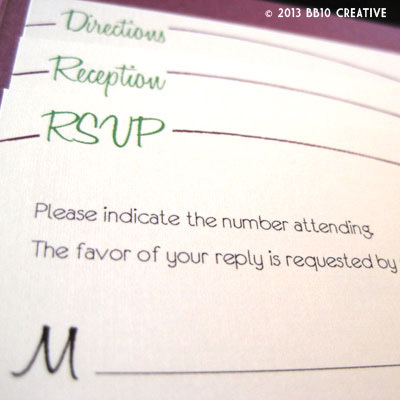 There is just a hint of green on the invitation and monogram border for a little pop of color. The design is very simple but classy and elegant. A lot of my clients have used silver in the past as an accent color for their weddings and are usually concerned with incorporating the color into the invitations. Because as we all know, attempting to print silver usually just looks gray. One of the easiest and my favorite ways to get around this dilemna is to use silver metallic paper for backings, sashes or envelopes. Now you might be thinking, metallic paper? Don’t worry, I’m not using sheets of tin foil or something. There are a few paper mills out there that create really elegant and pretty metallic paper lines. 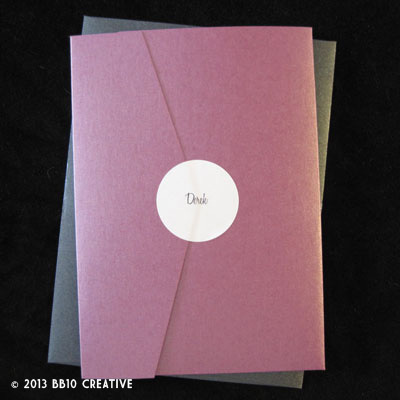 The paper has a nice sheen and slight texture and looks really great paired with textured papers or satin ribbon. Not to mention the envelopes really stand out in the mail – your guests will understand they are receiving something very special! Back to the work! We decided to print on a clean white linen cardstock and use a square black enclosure, complimented by the silver metallic envelopes. The design carried over very easily to their other wedding materials – save the dates, rehearsal dinner invitations, thank you cards, etc. I’m very excited about how these invitations turned out. As you’ll see in upcoming blogs, I have 2 other September weddings that use black as the main color and each has its own unique look. Check back soon for September Wedding Number Two: Rachel and Mike! 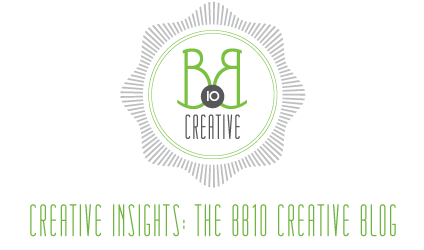 Don’t forget to check the BB10 Creative for the latest and greatest work. Our second wedding of 2010 is taking place April 24th. 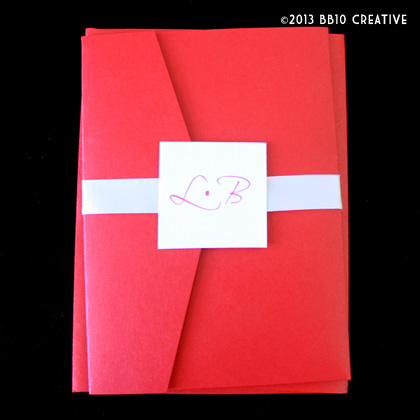 The clients, Amy and Nick, are very special to BB10 Creative, because Amy was one of my college roommates! I am very excited to be a part of their special day and can’t wait to see her walk down the aisle. Now, on to the work! Amy came to me for invitations pretty much with a blank slate. She knew her colors were going to be brown with a tiffany blue accent, and that she wanted something more modern and chic. One of the questions I ask all of my clients is “Is there anything you definitely don’t want to see on your invitations?” Amy knew for sure that she was not a fan of floral elements on the invitations. Beyond that, it was up to the creative brain power at BB10 to come up with some unique designs! 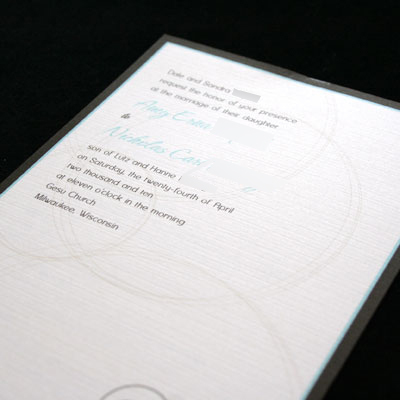 The final design chosen is a series of interlocking brown circles, very light in the background of the invitation, with a brown and light tiffany blue border. 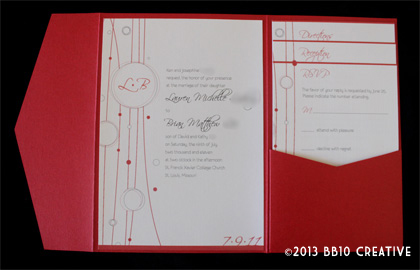 I also used the circles as a design element with the wedding date in the corner of the invitation. In keeping with the chic and modern look, we decided on a sans-serif font for the text, and a brush script font for highlighting the couples’ names. What I love best about this invitation besides the actual design, is the packaging. 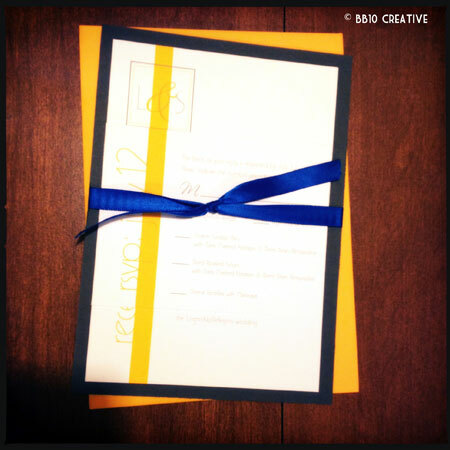 The invitation is printed on a clean white linen cardstock, and held together with very unique and fun italian paper clips. Perfect for the circle theme! The invitation was then placed inside a rich chocolate brown “half moon” enclosure, to which I added a gorgeous tiffany blue satin ribbon. To top it off, we used a square monogram on the front. 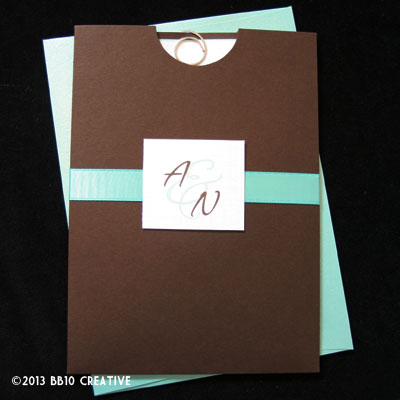 I also found perfectly matching tiffany blue metallic envelopes for mailing. The whole package is absolutely stunning and perfectly matches the modern and chic look Amy was going for. 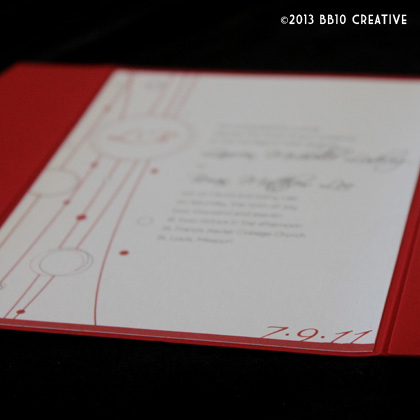 Amy loved the circle design so much, she decided to carry that theme throughout the wedding. She took my design to the cake designer to have the cake match, and is even using M&Ms for the guest gifts. 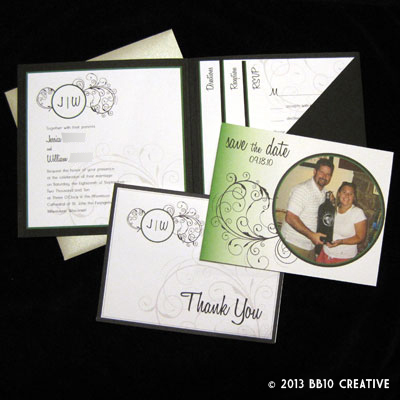 Program, place card and thank you card designs are still in the works for this wedding, so be sure to check out our samples on BB10 Creative to see how the design all comes together! 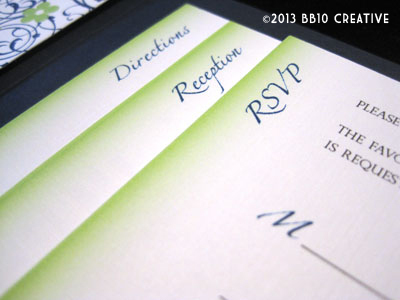 If you know of someone who is getting married and might not have any ideas in mind yet for their wedding, keep BB10 Creative in mind for invitation design. 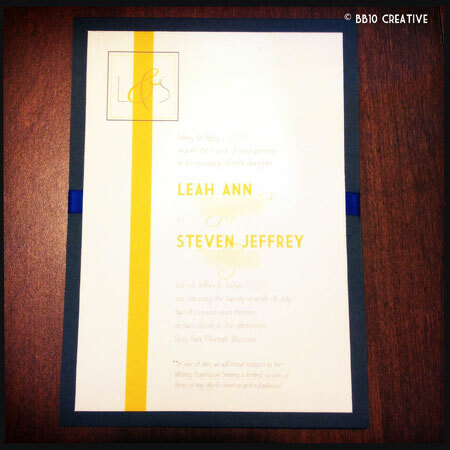 Amy and Nick’s invitations are a perfect example of the great work we can do when starting from a blank slate! And the best part is, our designs are completely unique and custom to YOUR wedding. 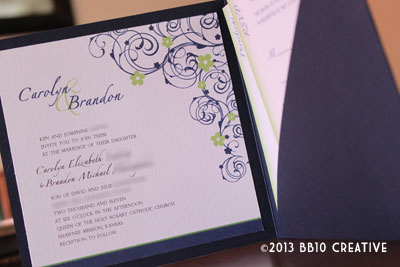 February has been a busy month for wedding invitations at BB10 Creative. We have had the pleasure of working with 3 great couples getting married April 10, April 24 and May 1! 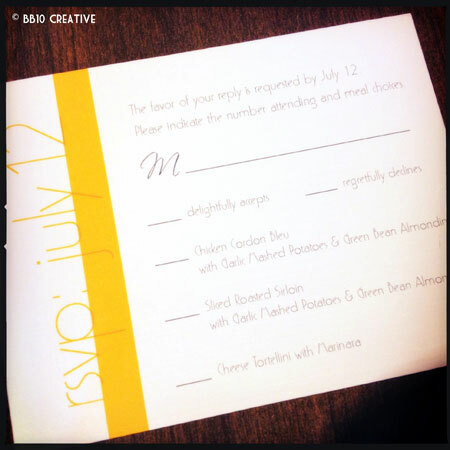 All have very different wedding themes, and as a result, very unique invitations. Our first wedding of 2010 takes place April 10th between two great people, Kristin and Adam. 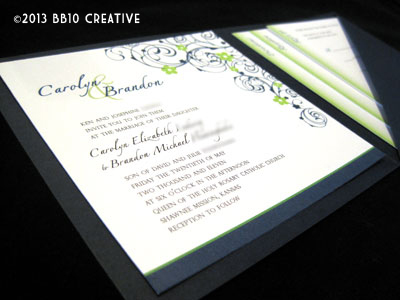 Kristin and Adam came to BB10 Creative looking for unique yet affordable invitations for their big day. They didn’t have anything particular in mind besides their colors of Teal and Fuchsia, and that they were going to play up Chicago and Milwaukee at the reception with photos of the cities on their tables. They were looking for something formal, yet modern. 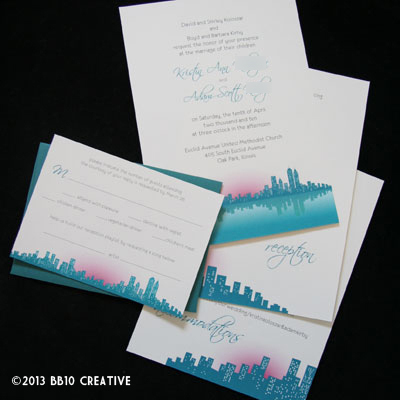 The result was this simple yet unique invitation, displaying the Chicago skyline in teal with a fuschia sunset. We used a sans-serif font for the main portion of the text, and a modern and ornate script font to highlight the couples’ names. 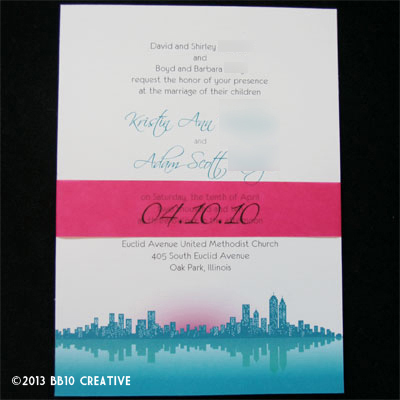 The invitation was printed on a heavy white cardstock, and the cards are held together by a fuschia “belly band” with the wedding date printed on the front. 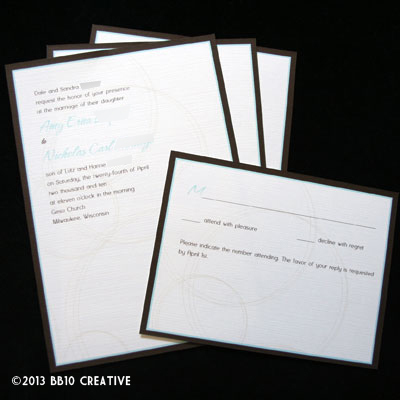 The couple decided on a teal RSVP envelope and a classic foil-lined white envelope for mailing. The reception and accommodation cards “zoom in” on details of the skyline, giving each card a different look. 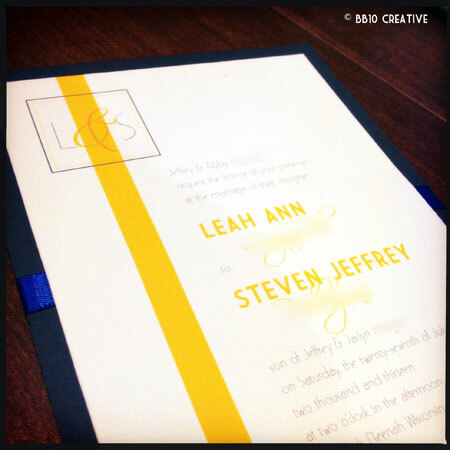 We’re really excited about how this invitation has turned out – it’s a very clean, classic and elegant look! 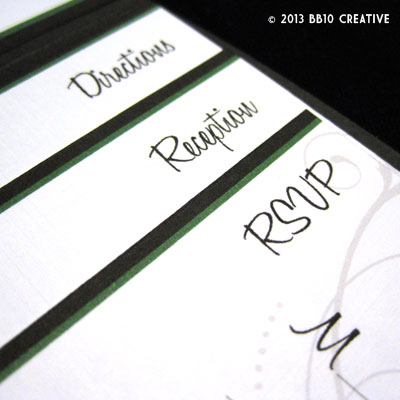 Program and place card designs are still in the works for this wedding, so check back on BB10 Creative to see how the final package all comes together.